This in vitro study characterized the removal efficacy of Nitrogen Dioxide (NO2) by the Novaerus NV1050 system. Novaerus’s NV1050 system is designed to eliminate harmful gases in order to purify rooms and create safe environments for occupants. The study included three (3) trials and a control run against NO2. NO2 was released into a sealed chamber while the monitoring of concentration was logged with specialized detectors. For the control trials, the NV1050 remained outside the chamber, and the gases were allowed to dissipate naturally over time. The NV1050 was moved inside the chamber for the test trials, the chamber was refilled with test gases and the NV1050 turned on once desirable concentrations of the gases had been reached. Chamber control trial data was subtracted from Novaerus trial data to yield net log reduction in the chamber for each challenge. The NV 1050 system was shown to be highly effective at removing NO2 from its environment. At 6 minutes it showed a net LOG reduction of 2.29 LOG and would have been higher if not for the limited resolution of the NO2 detector. 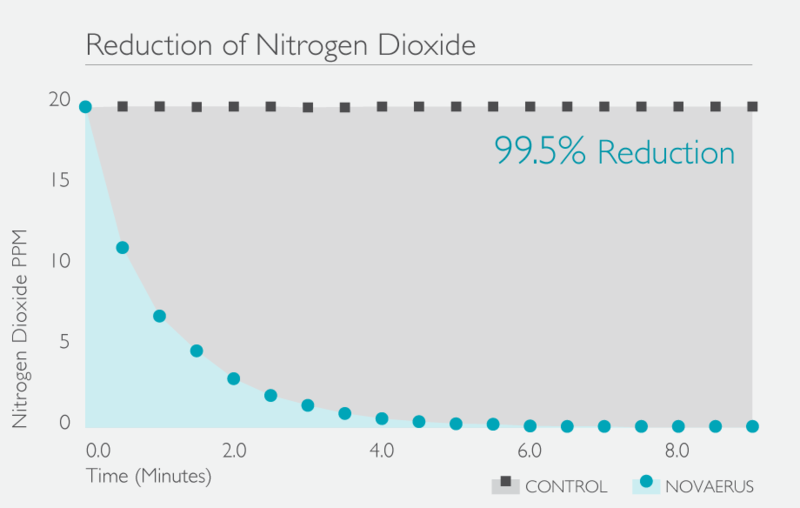 The concentration of NO2 was reduced from just under 20 parts per million (PPM) to 0 PPM in 7.5 minutes of operation of the NV1050 inside the ARE Labs environmental test chamber (16 m3 in volume). In comparison, in the control run the concentration of NO2 drops from just under 20 PPM to about 13 PPM in 8 hours in the environmental chamber. Note that the initial concentration of NO2 for this test is more than 10 times the safe limit as defined by NIOSH and the WHO. This test demonstrates that the NV1050 can remediate NO2 pollution effectively and quickly.